Yesterday’s post contained a self portrait waiting for notes, the above is the quintessential portrait of what my hands look like during load in. 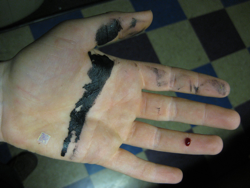 From left to right, a piece of omnipresent Christmas Carol glitter, black paint proving the painters have been at work on the set, and a small liquid ruby where I pricked my finger on a brad that popped through the side of the curb we were installing. However, this post is more about building than installing the set so here’s a more topical photo. I love the way the smoke looks coming out of the tube ends. It’s hard to catch in a photo though. There are so many things like this where the beauty in the process of my work is impossible to capture because I’m too busy building or what I’m seeing is beyond my ability to photograph. In this case I was waiting for the steel to cool so I could pop it out of the jig. We started building the set for Bountiful back in March. This set is riddled with trap doors like holes in swiss cheese and because of that it made more sense to build a completely custom stage than to try and use the few stock decks that still fit in amongst the traps. There are three lifts in the stage, the largest is twice the size of the next smaller lift. It is literally two of the medium size lifts set next to each other. This makes it easier and faster to build the parts because you can use the same jigs to set up the welding. I promise I’ll post all of the photos from this series of journal entries in the Gallery, where they’ll display a bit larger, as soon as I’ve finished writing about this play. Our master carpenter built all the automation for the two big lifts and their sunroofs. I’m hoping I can convince him to help me write another post later about how cool all the automation is. I think the big lift/sun roof unit may be the biggest one of its type that we’ve built. Combined, the lifts in this show are certainly the largest lift installation we’ve built during my time at ACT. I know, it’s not fair that these photos are so small but this post is really about The Trip to Bountiful not Christmas Carol. I snuck into the paint shop so I could take this picture and show you how complicated the floor plan is. The floor of this set is really the defining visual feature, and there was a fair amount of preparation that went into getting the planking ready to be installed. First the boards were cut to widths defined by the designer. Then they were cut into rough lengths and grouped into sections according to their placement and color. Once all of the boards had been labeled the painters stained them and sanded them to bring out the grain before varnishing them. At that point they were ready to become a floor. We started load in on April 12th, but in order to bring the set into the theatre first we had to put Christmas Carol to bed. The set for Christmas Carol lives under the stage for all of the winter break while rentals happen in the theatre on top of a plain black stage which we put down over the Christmas Carol floor. Every year the first thing we have to do in the arena theatre is pull out the Christmas set and store it on the proscenium stage behind the painted curtain. Here are two views of the moving parts of the sunroof that opens the stage above the lifts. This is part of the lift car for the medium sized lift. I’m afraid the rest of the load in will have to wait until later. Nick just texted to say that they’re finished with rehearsal for tonight and are discussing notes. That means I should have been in bed a while ago and since tomorrow is another day of doing what those notes tell us need to be done, I’d best get some sleep.